Red-hot rookie Ronald Acuna Jr. departed early due to injury after getting drilled by an opening pitch, but the Atlanta Braves still finished a four-game sweep over the visiting Miami Marlins with a 5-2 win Wednesday. Acuna, who had led off the previous three games with home runs and had gone deep in five straight, was hit by a 97 mph fastball on the first pitch of the contest, setting off a benches-clearing incident that led to the ejection of Miami starter Jose Urena and Atlanta manager Brian Snitker. Acuna ran the bases and took his position in the outfield in the second inning, but he was subsequently removed. 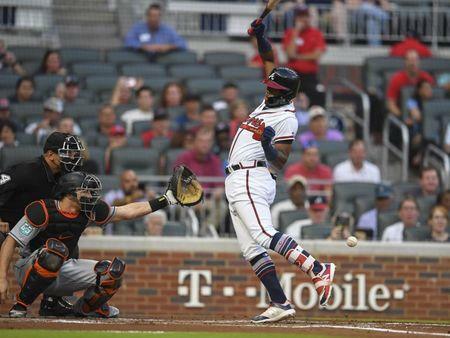 After the game, Snitker said Acuna exited due to cramps in his arm but that the team would know more about the 20-year-old's condition Thursday. After falling behind 2-0, the Braves came back to win their fifth straight game. Atlanta (68-51) is a season-best 17 games over .500 and two games ahead of the Philadelphia Phillies in first place in the National League East. Wilson Ramos had three extra-base hits in his Phillies debut, helping Philadelphia end visiting Boston's five-game winning streak. Ramos had two doubles, a triple, three runs and three RBIs as the Phillies split the two-game series. The 31-year-old catcher, acquired from the Tampa Bay Rays on July 31 despite nursing a hamstring injury, was activated off the 10-day disabled list before the game. He had been out since July 15. Nick Williams and Justin Bour each added two hits for the Phillies. Brock Holt had a pair of hits for the Red Sox. Austin Gomber pitched six shutout innings, and St. Louis extended its season-best winning streak to eight games in beating visiting Washington. Matt Carpenter, who extended his streak of reaching base in 33 straight games, was hit on his right hand in the seventh inning by a Matt Grace pitch and departed early. The Cardinals later announced that X-rays were negative and that Carpenter was removed for precautionary reasons. St. Louis improved to 19-9 since interim manager Mike Shildt replaced the fired Mike Matheny. Washington has dropped four straight games and seven of its past nine. Gerrit Cole posted his seventh double-digit strikeout start of the season, and Houston bashed five home runs in snapping its nine-game home losing skid with an interleague victory over Colorado. The Astros salvaged the finale of their six-game homestand with an offensive eruption, producing their highest scoring output at home since a 12-6 win over the Chicago White Sox on July 7. Houston had dropped five games in a row. Evan Gattis and Tyler White blasted two home runs apiece, and Yuri Gurriel also went deep for the Astros. With his 12 strikeouts on the mound, Cole (11-5) recorded the Astros' 25th double-digit strikeout game of the season, a franchise record that ranks tied for second all-time in American League history. Brian Dozier hit a game-ending sacrifice fly in the 12th inning as Los Angeles beat visiting San Francisco to end a five-game losing streak. Yasmani Grandal doubled to open the 12th inning against Giants reliever Casey Kelly (0-1). Grandal took third on Max Muncy's single and scored on Dozier's second career game-ending RBI. The Dodgers' recent bullpen issues surfaced once again in the late innings as Andrew McCutchen crushed a game-tying, three-run home run to center field in the eighth inning off Caleb Ferguson. Kevin Plawecki hit a grand slam, Todd Frazier homered and drove in four runs, and Brandon Nimmo went 5-for-5 with three RBIs as visiting New York crushed Baltimore. The Mets scored early but broke the game open with a nine-run sixth inning, sending 12 batters to the plate. Plawecki's grand slam, off rookie right-hander Evan Phillips, was the inning's big blow. The Mets' nine-run inning included four walks, a hit batter, two doubles, a triple and Plawecki's slam. The sixth-inning explosion let New York manager Mickey Callaway pull starter Zack Wheeler after five innings. Wheeler (8-6), who has won six consecutive starts, allowed one run on five hits. He walked two and struck out three. Mallex Smith hit a two-run homer in the fourth inning and fell a triple shy of the cycle as Tampa Bay beat host New York. Smith helped the Rays even the three-game series at one win apiece when he lifted a first-pitch breaking ball from Luis Cessa (1-3) into the right field seats. Smith's homer made it 5-1, and the Rays cruised to their seventh win in their past nine meetings against the Yankees. Brandon Lowe drove in the first two runs of his career with run-scoring singles in the second and fifth innings. Kevin Kiermaier added an RBI single in the third for the Rays. Bobby Wilson homered and hit an RBI single, and Logan Forsythe drove in three runs with two singles to lead Minnesota past visiting Pittsburgh for a sweep of a two-game series. Jose Berrios, in his first career start against the Pirates, allowed four runs (three earned) and seven hits in 3 2/3 innings. Gabriel Moya (3-0), the third of six Minnesota pitchers, tossed a scoreless 1 1/3 innings for the win, and Trevor Hildenberger pitched the ninth for his third save. Elias Diaz homered, and Gregory Polanco had a two-run single for Pittsburgh, which ended its road trip 4-5 after losing the last three games. Chris Archer, making his third start for Pittsburgh, allowed four runs and six hits in five innings. He struck out seven and walked none. Melky Cabrera smacked a two-run homer, and Cleveland took advantage of a strong bullpen effort to beat host Cincinnati in sweeping the three-game interleague series. The Indians won their fifth straight thanks to a bullpen that rescued starter Shane Bieber, who made it through only 4 1/3 innings, giving up three runs on seven hits. Cleveland's bullpen took over, with five relievers combining to give up just three hits and two walks with eight strikeouts in 4 2/3 scoreless innings. The Reds lost their fourth straight after scoring three runs in the bottom of the first inning to give starter Robert Stephenson a 3-0 lead. Cincinnati was held scoreless with six hits in the game's final eight innings. Curtis Granderson hit a grand slam in a five-run fourth inning, Kevin Pillar had a pair of RBI singles, and visiting Toronto held on to defeat Kansas City. Marco Estrada (6-9) allowed four runs, six hits and one walk while striking out three in 6 2/3 innings for the Blue Jays, who have won two in a row after dropping the opener of the four-game series. Salvador Perez had three hits, including two home runs, and drove in three runs for the Royals, and Ryan O'Hearn added a pinch-hit homer. Jorge Lopez (0-2), making his first start for the Royals after being obtained in a trade with Milwaukee, allowed six runs and eight hits in 4 2/3 innings. Rene Rivera homered with one out in the top of the ninth to break a 2-2 tie and give visiting Los Angeles a victory over San Diego and a sweep of the three-game series. Rivera, who was the Padres' team Most Valuable Player in 2014, pulled the first pitch he saw from San Diego closer Kirby Yates 407 feet into the left field stands to snap a 2-2 tie for the Angels, who have won seven of their past nine. Cory Spangenberg hit his seventh homer for the Padres, who have dropped four of their last five immediately after winning four of five. Anthony Rizzo homered, stole two bases and drove in three runs, and Jason Heyward had three hits, including a pair of doubles, and drove in two runs to lead Chicago to a win over visiting Milwaukee. Albert Almora Jr. also homered for Chicago, which increased its lead over the Brewers to three games in the NL Central with the victory. David Bote had two hits and scored two runs while Javier Baez tripled and had two hits and also scored a run. Brewers left fielder Ryan Braun left the game in the fifth inning with what the club announced as right ribcage tightness. Braun, who hit two homers in Milwaukee's 7-0 win over the Cubs on Tuesday, apparently was hurt attempting to make a sliding catch on Heyward's RBI double in the third inning. Dee Gordon ended a scoreless deadlock with a two-run home run in the 12th inning, giving Seattle a victory over host Oakland to prevent a three-game sweep. Seattle's Mike Leake dueled Oakland's Brett Anderson in a 0-0 game for eight innings, and Edwin Diaz finished it with his 47th save of the season, allowing the Mariners to pull within 2 1/2 games of the A's in the American League wild-card race. Mike Zunino drew a one-out walk from Oakland's Yusmeiro Petit (5-3) in the 12th before Gordon hit the next pitch for just his second home run of the season. Nick Martini collected three hits while Matt Olson chipped in with a double and a single for the A's, who had won four in a row. Matt Davidson and Jose Abreu hit two-run homers to back another solid outing by Carlos Rodon as Chicago held off host Detroit. Davidson had three hits and scored twice while Abreu delivered three hits and knocked in three runs. Yolmer Sanchez added three hits, a run and an RBI for the White Sox, who took the last two games of the three-game series after losing nine of their first 10 matchups with their division rival this season. Rodon (4-3) hadn't given up more than two earned runs in his previous six starts. He was touched for a three-run third but was otherwise stingy once again. He went eight innings, allowing five hits and a walk while striking out six.